A delightful bookplate depicting a gathering of fairies listening to a story has been discovered on two items in our collection. One on a copy of the 1622 edition of the Poly-Olbion by Michael Drayton (a topographical poem describing England and Wales celebrating antiquities, bards and King Arthur; and which contains a half-title: ‘The Faerie-Land’), and one on the 1806 edition of Camden’s Britannia. The bookplate contains a number of small armorial shields tucked within the picture; one of these has ‘Marl Coll’ written on it and depicts the arms of Marlborough College, another has a Latin motto “Dominus illuminatio mea” (The Lord is my Light) and is the motto and arms of the University of Oxford; it would perhaps imply that Williams attended Oxford as well. A third depicts a boar’s head with a Welsh banner “Bydd cyfiawn a phaid ofni” (Be righteous and fear not). 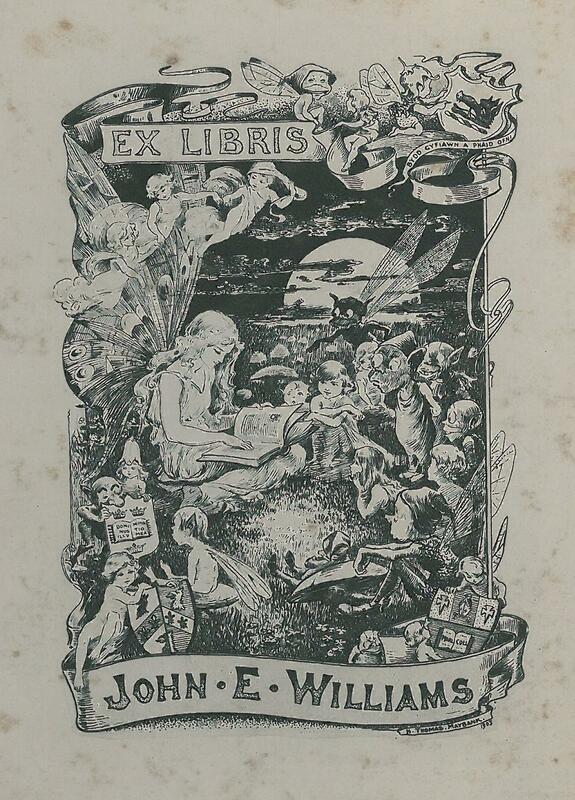 The bookplate itself was designed by H. Thomas Maybank (1869-1929), and is dated 1903. As an artist and illustrator he was known for his depictions of fairies and pixies and magical landscapes which were used on Underground advertising posters, prints, and children’s books. He contributed to Punch and The Daily Sketch, and was the first artist to illustrate the Uncle Oojah comic strip. We would welcome any more information on the armorial shields in the design. This entry was posted in Karen Pierce and tagged bookplates, Cardiff Rare Books Collection, Fairies, H. Thomas Maybank. Bookmark the permalink.